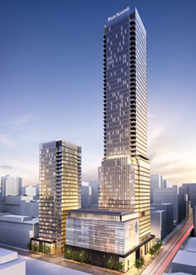 FOUR SEASONS located at 1263 Bay St. in the heart of Yorkville features the city’s most luxurious private residences in the 55 storey Toronto landmark. Only steps away from the business district, but also is in the fashionable shopping and entertainment quarter, enjoy best of both worlds with Four Seasons . All residences feature a doorman, bar, restaurant, Four Season Spa, Outdoor summer terraces, state of the art fitness club, valet parking, banquet and ballroom facilities, indoor lap pool, whirlpools, private treatment rooms and 24 Hour Concierge.